Nicky Whittall - Independent Stampin' Up! Demonstrator - Cavalier Crafts: Miss It......Miss Out!! 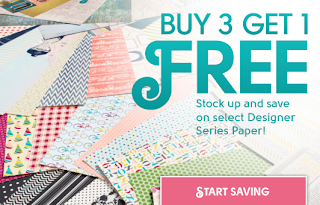 There is only just over a week left before the fantastic Buy 3 Get 1 Free promotion ends. You have until Saturday 31st August to take advantage of this deal. Order 3 packs of any of the Designer Series Paper priced at £9.95 (see pages 151, 153 and 154 of the Annual Catalogue) and you will get a 4th one for FREE!! !